New technology product: Bluetooth Low Energy Tire Pressure Monitoring System Retrofit Kit (hereinafter referred to as BLE TPMS), the driver could get the real-time tire pressure and temperature through smart phone by using this kit while driving. When the system detects the abnormal status, it will alarm the driver actively, and show the abnormal data and its tire location on BLE TPMS APP (hereinafter referred to as APP). BLE TPMS includes four sensors. It could be connected wirelessly to a smart phone by Bluetooth technology. 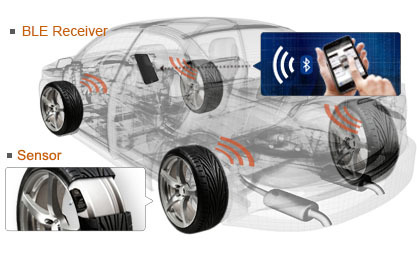 The BLE TPMS sensor could detect the tire data and transmit it to the connected smart phone, showing the tire data of the corresponding tire on the BLE TPMS APP and the driver could access the data in real time.